are teaming up over the next couple of days to bring you tons of inspiration! Both companies are offering a sweet prize, so be sure to stop by and say "hi!" Oh boy do I love making some 3D projects! 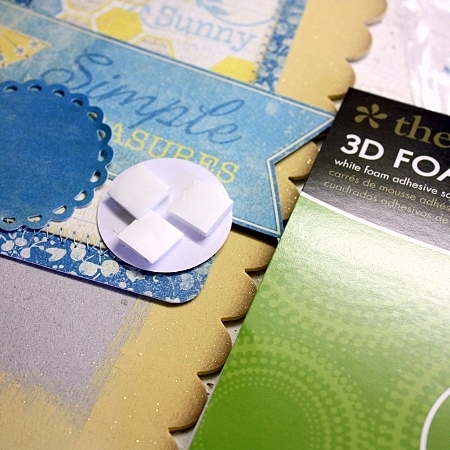 I am definitely not a flat crafter so Therm O Web's 3D Foam Squares are a favorite friend of mine. which adds just the finest sprinkling of shimmer. For my project today I've combined pieces from the new Seasons: Summer collection, to create a little hanging for the door or wall. Seasons: Summer is a petite collection and follow-up to Seasons: Winter and Spring. To get started, I took a scallop chipboard sheet (from a Maya Road chipboard album set) and painted it in a warm yellow acrylic paint. Next, I distressed the edges by dipping a sponge with ColorBox Mudslide ink and then wiping it across the edge. 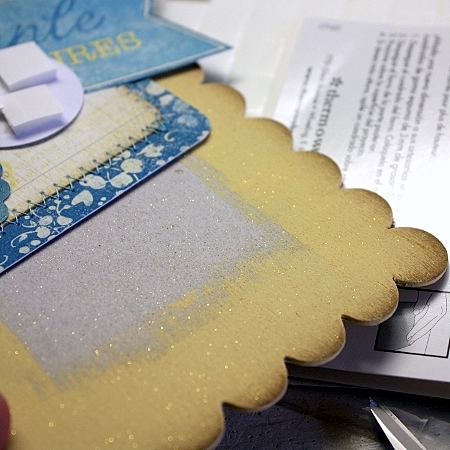 Shake the can of Glitter Dust well and then lightly spritz the chipboard. I love that the sprinkles are random and not overly heavy...it's just right for a project such as this. I used the larger 3D Foam Squares on the paper piecing, the round sticker, and the sentiment. For the leaves and the small hexagon pieces, I used the small 3D Foam Squares. Yes, I believe in using a lot of foam! Although you can't see it very well in the photos, I did lightly spray the hexagon cut-out shapes with the Glitter Dust before adhering them to the paper. 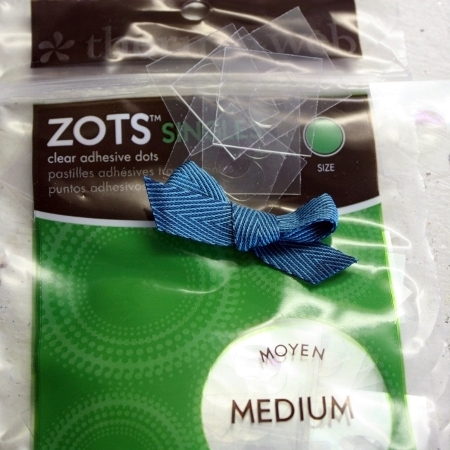 I like using a thin ZOTS for things like ribbon, bows and buttons...it sticks! Now it's all done and ready for hanging or gift-giving! I also love to attach hangers like this to a plain grapevine wreath and hang on a door (covered and safe from the elements). You will love Seasons: Summer...I can't wait for you to see it all! Beautiful project and I'm loving the look of that Gold Glitter Dust! This is beautiful and I love it!! 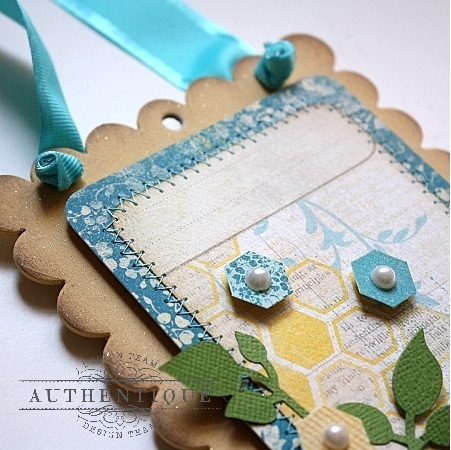 Thank you for yet another bit of inspiration of how I can use my scrapbooking supplies to make gorgeous home decor! You are awesome - great explanations also! !